Pan makes two each of three mustache styles ? handlebar with curled-up ends, the Pancho Villa with downturned ends, and the traditional chevron. Make cookies or add lollipop sticks for edible photo props ? fun for kids and adults alike. Non-stick coating on pan means your cookies will release easily. Mustache cookies measure approximately 4 in. (10 cm) across. 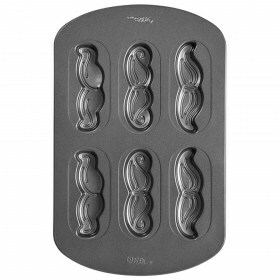 The six-cavity pan includes three mustache styles ? the handlebar with its bushy center and curled-up ends, the Pancho Villa with its downturned ends, and the slimmer chevron style. Whether you make cookies or add lollipop sticks to create edible photo props, these fun cookies are perfect for so many occasions! Since the pan is non-stick, your cookies will release easily from the pan. Recipes included on pan label. Mustache cookies measure approximately 4 in. (10 cm) across.